Friday Harbor Bed and Breakfast ( or small inn ). Find one now. Built in 1907, this gracious historic home of noted industrialist Peter Kirk is located just minutes from the Friday Harbor ferry terminal and provides guests with an opportunity to enjoy the comfort and relaxation of a bygone era. At the Kirk House we aspire to create a charming ambiance and a comfortable and caring place to spend your vacation or just a few days away from the stresses of daily life. Established in 1989, The Trumpeter Inn is one of San Juan Island’s premier Bed & Breakfasts and is located just 1-1/2 miles from the picturesque town of Friday Harbor in Washington State. Nestled among the rolling hills of the fertile San Juan Valley, The Trumpeter Inn is surrounded by ponds, meadows, and pristine marshlands, abundant with wildlife. Enjoy one of the most scenic flights you will ever experience aboard a Kenmore Air Seaplane departing from Lake Union in Seattle to Friday Harbor on San Juan Island. Once you arrive to Friday Harbor, it's time to find your Friday Harbor bed and breakfast! The Tucker House is just a stones throw from the Friday Harbor ferry landing. From the Tucker House, you can walk to downtown and check out the local shops. Grab a deli sandwich from Kings Market and then head out for an exciting day on the water aboard the Western Prince; a guided whale watching tour. Search for eagles, seals and orca in their natural habitat and talk with engaging naturalists about the local ecosystem. Tonight you can enjoy organic, island grown food at the Coho Restaurant. Take your car across on the ferry, a Scenic Byway to Friday Harbor, check into the Tucker House and then grab food for a picnic from Kings Market or get take out from one of Friday Harbor’s many great restaurants featuring organic local food. Drive along our country roads to the south end of San Juan Island where you can hike through golden fields along seaside cliffs at American Camp. Find a large log, unpack your lunch and relax at the beach for the day. This evening you can check out Friday Harbor’s nightlife or relax at the Tucker House. Wake up to a beautiful view of snowcapped Mount Baker and enjoy a delicious breakfast at your Friday Harbor bed and breakfast. Today you can have an adventure aboard the Western Prince. This guided whale watch cruise will take you throughout the San Juan Islands searching for orca whales, Dall’s porpoise, black oyster catchers, eagles and a variety of other sea life. Your naturalist guides will keep you informed on the geology, geography, and plant life that makes up the San Juan Islands…Washington’s natural wonder. This morning you can drive to Snug Harbor where you can take a guided sea kayaking tour with Crystal Seas Kayaking. Choose a day tour or a 3 hour tour and kayak the west-side of San Juan Island in search of eagles, seals, porpoise and orca whales while learning about the delicate ecosystem of the San Juan Islands. Once your tour is finished, you can drive back to downtown Friday Harbor to catch the ferry back to the mainland. Arrive at picturesque Friday Harbor and then check into Harrison House Suites near the ferry. Walk around Friday Harbor and check out all the local shops, activities, art galleries and restaurants. Enjoy a seafood dinner at Downriggers and then relax at your inn. Enjoy an unforgettable breakfast at the Harrison House and then walk to San Juan Excursions to check in for a wildlife adventure aboard the Odyssey. Your captain will take you to see orca whales, sea lions, pigeon guillemots and all sorts of other wildlife found in the San Juan Islands archipelago. Your naturalists will talk about the whales and share stories about the Salish Sea as well as pointing out the different family members of the local pods. Afterwards, you can enjoy dinner with food grown from the owner’s garden at the Coho Restaurant. Today you can rent bicycles from Island Bicycles and tour the island on wheels. Cycle out to the south end of the island where you can take a break at South Beach (American Camp) and walk from cove to cove. Tonight you can enjoy one of Friday Harbor’s amazing restaurants featuring Northwest Cuisine such as The Place or The Backdoor Kitchen. Wake up and then head to Mitchell Bay where you can enjoy a 3-hour or day kayaking tour with Crystal Seas Kayaking. Your guide will lead you along the west-side of San Juan Island in search of orca whales, eagles, seals and much more. Learn or improve your kayaking technique while paddling one of the most beautiful coastlines in the world. Once your tour is over, drive to the ferry landing and head back to the mainland. Bring your car to Friday Harbor and stay at one of San Juan Islands beautiful Bed and Breakfasts, contact the Bed and Breakfast Association of San Juan Island. Today can be leisurely as you walk around Friday Harbor visiting the local shops and galleries. Tonight you can enjoy dinner at one of San Juan Island’s fantastic restaurants such as “Vinny’s Restaurant” or “The Duck Soup Inn”. Today you can grab a picnic style lunch at Kings Market and then embark on a whale watch tour with San Juan Excursions. Your naturalists will educate you on the behavioral patterns of the whales as well as point out other wildlife that you come across along the way. Tonight you can enjoy Mexican food at Mi Casita or Dos Diablos. Wake up and go for a hike along Mount Finlayson located on the south end of San Juan Island. Bring a lunch, book and towel and spend the day lounging in the sun at South Beach. Here you might see fox, deer or bald eagles and you can dip into the cold water or hike from cove to cove. Tonight you can enjoy a Pacific Northwest dinner at “Downriggers” or “The Place” and then check out the local nightlife of Friday Harbor. Today you can spend the day sea kayaking with Crystal Seas Kayaking. Meet your guides for an informative safety lesson and paddling instruction and then get ready to paddle the wonderful coastline along the west-side of San Juan Island towards the Lime Kiln Lighthouse. Look for bald eagles in the trees and watch for orca whales passing by. 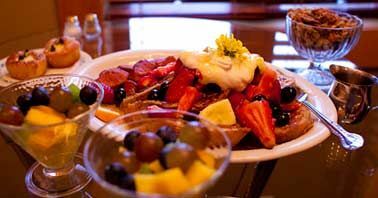 This morning enjoy your last delicious breakfast at your Friday Harbor bed and breakfast. Today you can visit the Pelindaba Lavender Farm and walk through the fragrant fields dotted with patches of lavender. Check out the Pelindaba store with all of its amazing and innovative lavender products. Afterwards, you may want to pick up a bottle of award winning wine from San Juan Vineyards before you head back on the ferry to the mainland.